Lincoln Electric announces the release of their Project Based Lessons for the VRTEX welding training systems featuring a set of lessons that can be implemented into existing welding curriculum programs. To be released at FABTECH in Chicago, the lessons are designed with references and ties to the educational common core standards, as well as the American Welding Society SENSE standards. This first release (part number K4057-1) will be available for sale in conjunction with its FABTECH introduction. VRTEX virtual reality welding training systems have proven that welding education is more effective and efficient with a blended training approach. Combining hands-on welding training with lessons on a virtual reality welding system provides students with an opportunity to practice, develop and refine proper welding body position and technique, as well as learn by interacting and collaborating with classmates. Lincoln Electric’s project-based learning is an effective educational model that allows students to benefit from solving complex problems in a multi-disciplinary approach; using fundamental skills (reading, writing, and math); incorporating 21st century skills (teamwork, problem solving, research gathering, time management, information synthesising, utilising high tech tools); targeting multiple and various styles of learning; and motivating students with technology and engaging learning processes. The VRTEX product line offers realistic welding visual and audio feedback to allow students to learn welding techniques in a simulated environment. The VRTEX 360 takes best-in-class virtual welding training to a new level, providing a realistic, retractable SMAW device; tube and pipe welding, as well as additional common joints; and a flexible and all-position table and stand. The system also comes with the eXtensions software program, which offers an ongoing set of expanded features and functionality, including additional material types, joints, instructor analysis, testing tools and more. 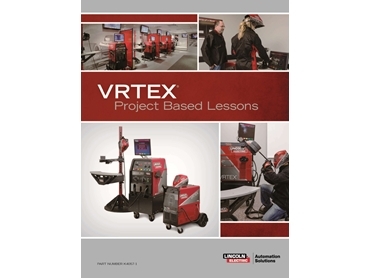 The VRTEX Mobile is designed for virtual welding training on the go. Featuring a portable design, it brings the benefits of the VRTEX systems to mobile welding training, recruiting and career fairs, community outreach programs, evaluation and screening and other situations where a lightweight, easily transportable system is required. Lincoln Electric is the world leader in the design, development and manufacture of arc welding products, robotic arc welding systems, and plasma and oxyfuel cutting equipment.